With winter in full swing, warm soup is the perfect food. 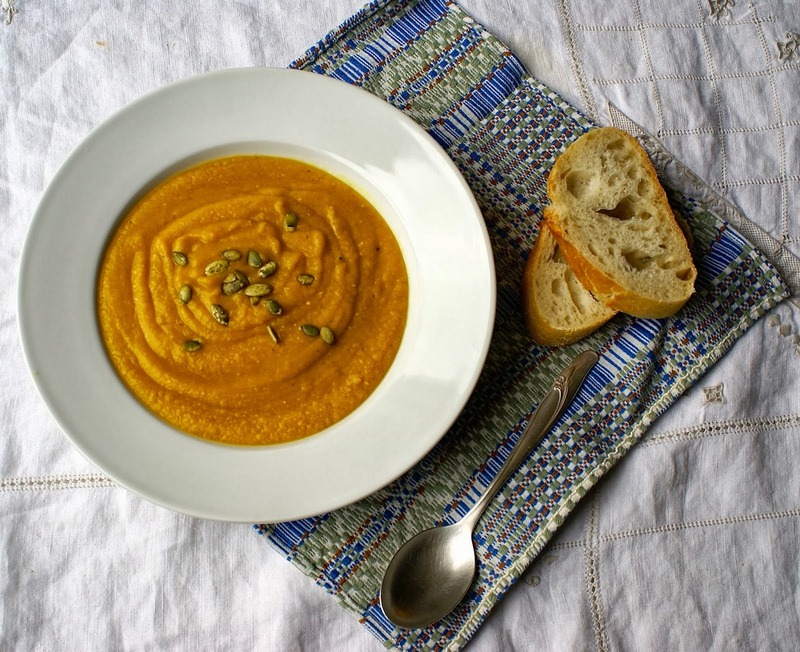 So grab some good crusty bread and make this velvety squash and red lentil soup tonight! In a large pot, heat coconut oil on medium heat until melted. Add onion and saute for 5 minutes then add the garlic and saute another minute. Add butternut squash, red lentils, turmeric, ginger, cinnamon, nutmeg, and 1/2 the salt. Saute for 30 seconds then add 4 cups of water. Bring to a boil, then cover and simmer for 15-20 minutes, or until squash is tender when poked with a fork. Serve warm with crusty bread and toasted pumpkin seeds. We first met Christen Brown many years ago, when we walked into her fiber arts shop, The Store On The Corner, in San Diego, California. We all said, "Wow" and proceeded to admire the fiber art models all over the store, many of which were classes created and taught by Christen. Fast forward a few years, after she closed her store to design and teach full time, and Christen finally has the chance to focus on writing and publishing. People all over the world are now benefitting from Christen's knowledge, covering traditional embroidery, bead embroidery, silk ribbon work, and wearable art. No matter what kind of needlework you are doing, you can benefit from Christen's ideas, techniques, and instruction. If you've ever used threads, beads and stitches — or want to use them — she's a go-to person for techniques and inspiration. Christen's latest book is "Embroidered & Embellished: 85 Stitches Using Thread, Floss, Ribbon, Beads & More," from C&T Publishing. You can never go wrong with having stitch books in your personal library, and this book features very nice, bright, and clear step-by-step photos for each stitch. Good photos are crucial for learning on your own at home, and this book won't disappoint. There are many photos of finished projects, which helps you see the gorgeous result of these embroidered details. Most are mixed media, crazy-quilt-style designs, but inspiring nonetheless, whether you are doing that kind of hand embroidery or doing cross stitch and needlepoint. In this book you will learn how to combine some of your favorite stitches and a few new ones with beads to create dimensional embroidery. 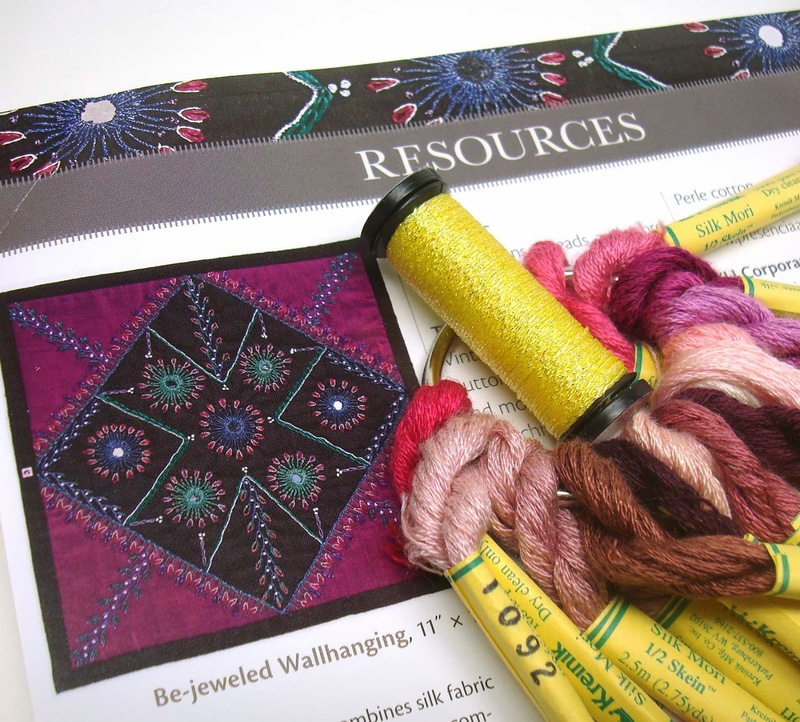 She also includes tips for using a variety of threads, such as Kreinik metallics, with beads. This is information you can use to make your cross stitch designs a little more dimensional, to create different beaded effects in needlepoint projects, or to add embroidered details to your sewing and quilting designs. It's the kind of book that inspires you to play a little more in your own needlework, and that's always a good thing. 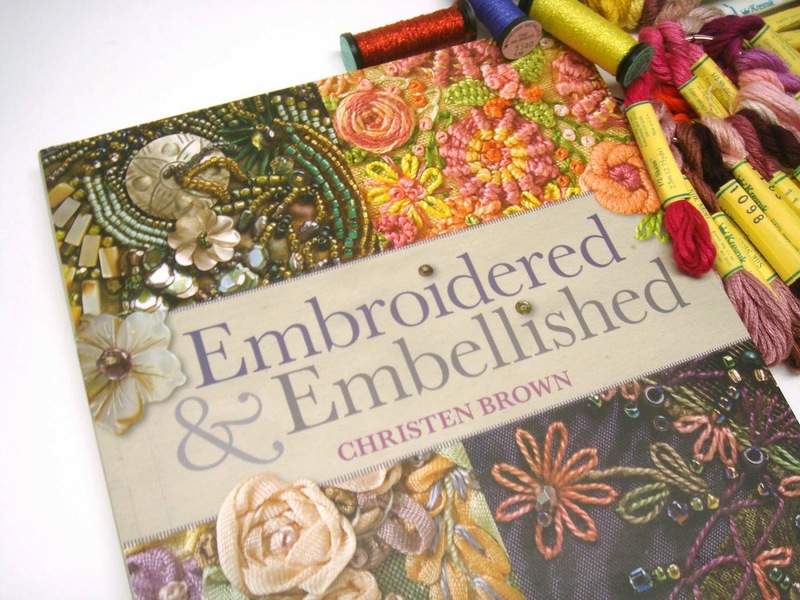 Look for "Embroidered & Embellished" by Christen Brown in your local needlework store or online bookseller. 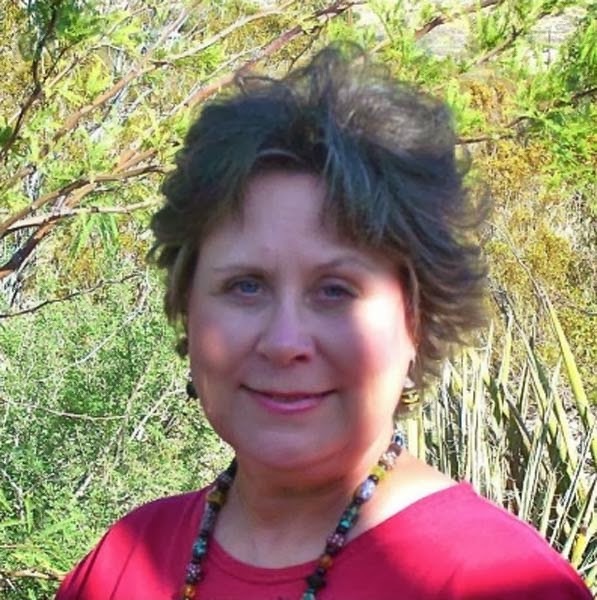 For more information on Christen, her online classes, and online Store On The Corner, visit www.christenbrown.com. I'm always on the lookout for the next awesome knitting needles. No matter how many I have, I always want to try out something new because no needles are perfect for every project. In the past, I've had trouble knitting with silk thread on very small needles -- US size 00 / 1.75mm and smaller -- because the steel needles were too slick and flexible. They bent in my hands, stitches dropped too easily, and I could never get the tension I wanted with the slippery fiber on the slippery needles. I recently discovered a solution to my dilemma: carbon fiber needles. These needles have some tooth to them! The slippery silk yarn actually stuck to the needles, allowing me to have more control over my knitting, even on size 0000 needle working with fine silk thread. I was able to knit stockinette with even tension and nice, neat stitches, and lace without worrying about dropping yarn overs. The carbon fiber itself is very strong and does not bend in my hands the way fine steel needles do. In addition, they needles are warm to the touch when you are using them, making them much more comfortable for those with arthritis or for anyone knitting in the winter. At the last TNNA show, I tried several different brands and found them all wonderful to work with. Here are my experiences with these needles, in no particular order. 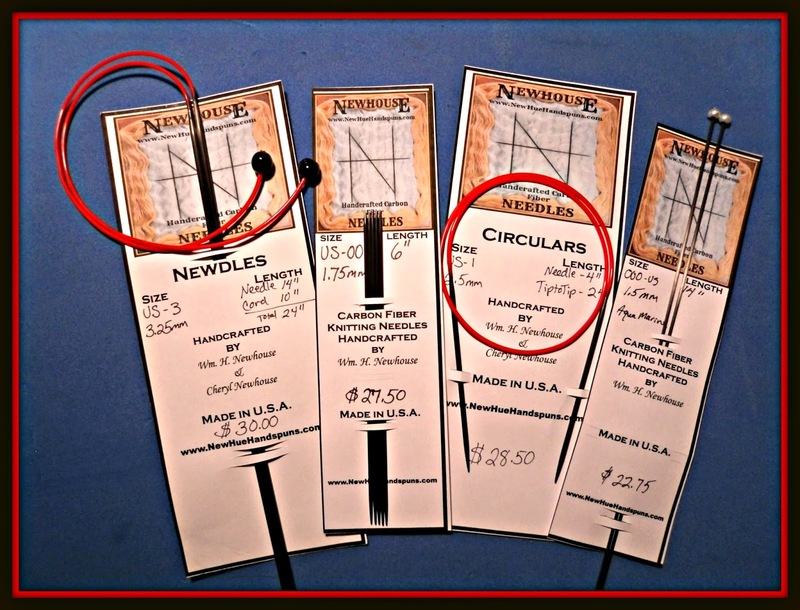 I used double-pointed needles, but I'll note which brands also offer circulars. Because of the steel points, these needles are amazing to work with in any size and on almost any type of project. The pointy steel tips make them fast for knitting and the warm, toothy carbon fiber holds on to your stitches once you get them onto the needles. I am tempted to get a set of interchangeable circulars in this brand. I think these are my favorite double-points in the carbon fiber needles because they come in the longer lengths. I usually prefer to work with 8 inch dpns, except when I am knitting glove fingers. I find the longer lengths hold more stitches easily and because I knit with 4 needles (not 5), the extra length keeps the needle tips of the two unused needles from stabbing me while I’m working with the other two. This is less of a problem when working with 5 dpns. • Lengths from 3 to 15"
These are the original carbon needles, made in the USA from 100% carbon fiber—the material used for the outer skin of the Blackbird Stealth Jet. They aren’t cheap, but they are definitely wonderful to work with, especially if you prefer the 6” length dpns. And the leather case is the perfect accessory if you travel with your dpns. Colonial needle also carries a wonderful variety of other product including bamboo and wooden dpns and circular needles. Yesterday's Winter Classic outdoor hockey game featured snow drifts on the ice. The US midwest has been shoveling out for days, and the northeast is getting ready to be slammed with a blizzard tonight and tomorrow. No doubt about it: winter is here for many parts of the globe. 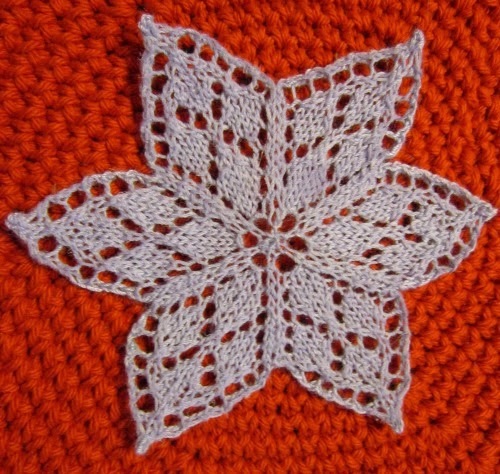 As the saying goes, if you can't beat it, join it — that is, join it in stitching some snowflakes of your own. You will be warm, dry, and making crystalline creations of the non-messy, non-frozen kind. 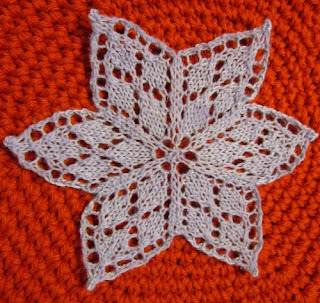 For knitted snowflake designs, we love the collection of patterns by knit designer Elizabeth Ravenwood. 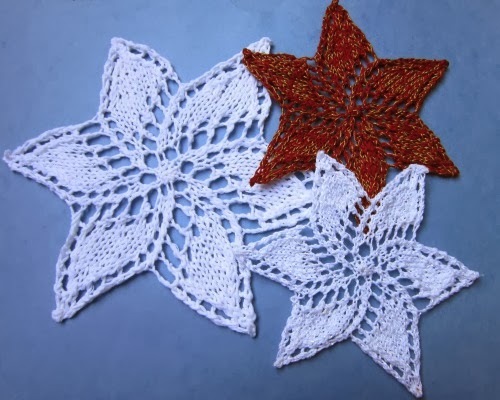 The projects are small to make a quick-knit, and can be used for winter decor or to get you started on Christmas 2014 ornaments. 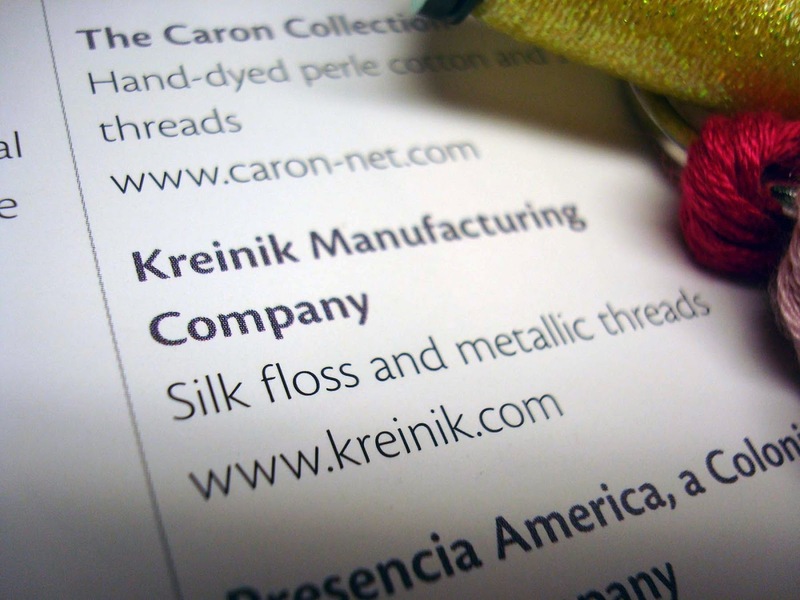 What makes them really stand out, however, is the sparkle from Kreinik metallic threads. Use these soft fibers as carry-alongs to add the subtle shimmer and kaleidoscope of color you see in real snowflakes. 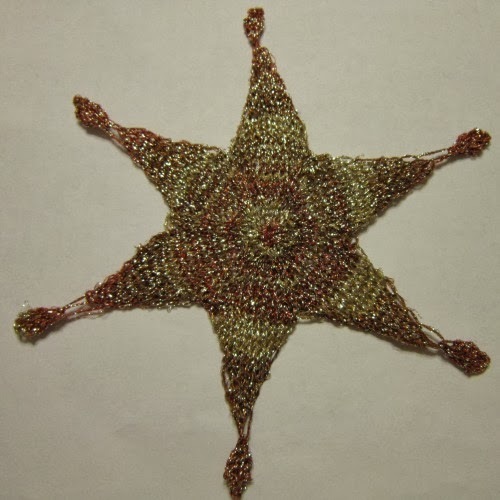 "Any of them can use the Kreinik threads that can be knit with size 1 needles," Elizabeth says. "For mine, I used Kreinik's Metallic Ombre (Molly), Heavy #32 Braid (Lily), the K2Tog [Blending Filament] carry-along thread in autumn colors (Gypsy), and Fine #8 Braid (Emma and Tina)."